If you want to keep track with what's going on electronic dance music wise in your city, then check out this weekend guide. Just click below and start planning! The ever changing landscape of dance music continues to shape billings throughout the festival circuit, and 2019 has been no exception for the stable of Canadian electronic festivals. Over the past few years the Canadian festival market has taken a substantial hit—booking costs combined with a suffering Canadian dollar has resulted in the collapse of more than one juggernaut festival. While every 2019 Canadian festival has accomplished something simply by surviving to live another year the are undoubtedly standouts for the upcoming summer season. Starting off on the West Coast, Shambhala remains a pinnacle of what a boutique festival can offer. From its humble beginnings to 2019's unparalleled offering it has managed to stay faithful to it's core intentions of authenticity within the world of corporate dance music. Standouts include Diplo & Mark Ronson's collaborative project Silk City, a rare set by Chris Lake & Chris Lorenzo as Anti Up, and what is sure to be a unique set from Kaskade—but the heart of the festival remains with the Shambhala Favourites lineup; which, as always, is stacked with popular fan legacy artists. To this day the festival continues to be a truly singular experience curated for dance music purists, and those looking for a bucket list experience. While Shambhala continues its reign as the preeminent celebration of dance culture within the Canadian (and global?) scene, those who can't make it out to Salmo BC, have Ever After. Over the past five years Ever After has been making a play for Shambhala vibes and offers heavy hitting headliners Excision, Illenium, and Kill The Snails (Kill the Noise & Snails). Over the past few years Toronto's Veld Festival has vied for the top spot in the hybrid category and for its 2019 edition it has successfully stepped up to the plate. Perhaps the most important factor here; although Veld has evolved in order to stay modern it has also remained as true as possible to its history as a purely dance music festival. Making his second Canadian appearance in year's Skrillex stands tall, and the undeniable draw of dance music juggernauts Tiesto and Kygo solidifies Veld's unbeatable stable of headliners. Add Cardi B, Kodak Black, Boogie, and a handful of other rappers to the mix and Veld's fusion of dance music and rap is perfect representation of what a hybrid festival can be. 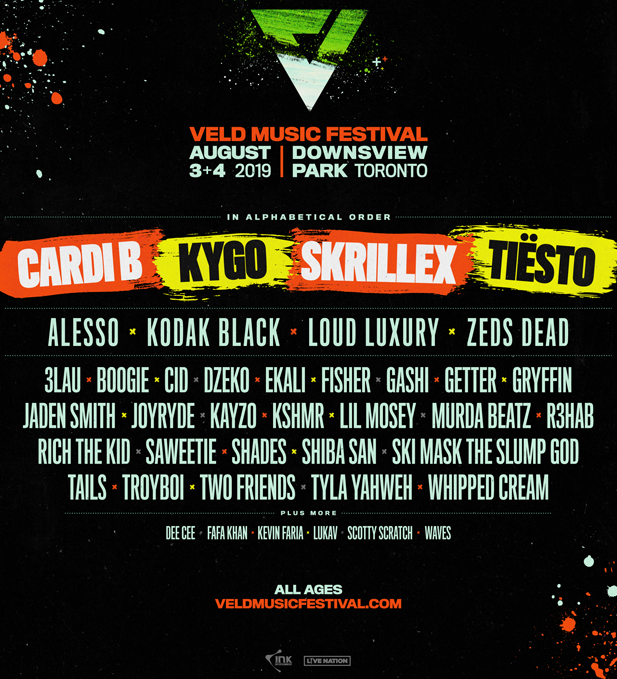 While Veld has provided dance music festival-goers with a varied slate offering them a taste of the rap world this years FVDED lineup has veered heavily towards rap/r&b. For West Coast festival lovers unable to attend Veld, FVDED still provides dance music favourites like Zedd and RL Grime; but four of its top five billings herald from the rap/r&b world, of which over fifty percent of their lineup is comprised. View this year's iteration as a hip-hop festival for fans looking for a little dance with their rap. 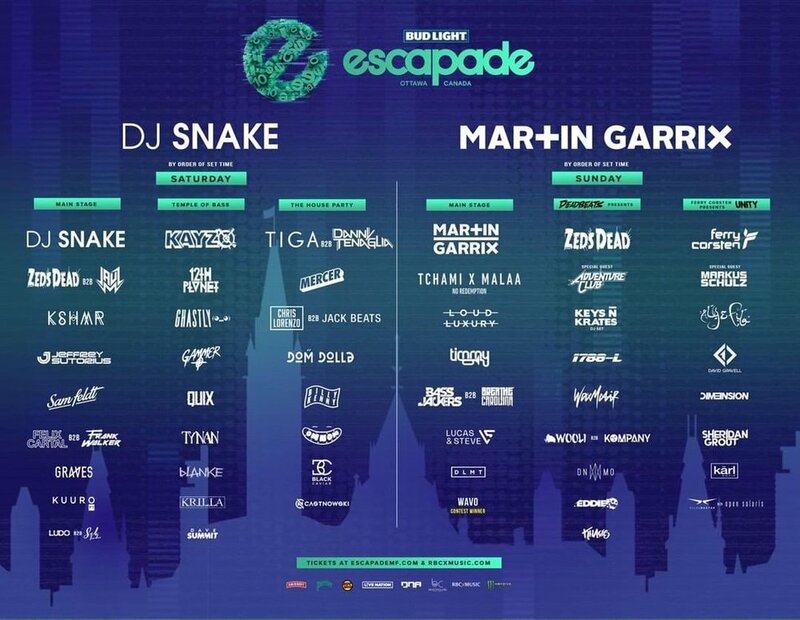 Although Veld's lineup is so strong that it almost challenged Escapade for this year's Canadian dance music crown, it is impossible to ignore the power and diversity of Escapade's lineup—easily the closest a Canadian dance music event can come to achieving those Ultra/EDC feels. Bolstering four curated stages, including; Deadbeats from Canadian bass legends Zeds Dead, The House Party headlined by Danny Tenaglia-b2b-Tiga, and Ferry Corsten presents Unity...offering the best trance lineup of the year. From here you have two of the most sought after back-to-back collaborations currently booking festivals—the now fabled No Redemption from Tchami X Malaa, and the far more rare (but...oh,so-good) Zeds Dead-b2b-Jauz. With Martin Garrix and DJ Snake headlining the festival it truly offers festival-goers with an open mind a world class smattering of ever genre of dance music. House and trance legends, through bass maestros, and main stage titans—come prepared to be surprised; the talent across the board is world class. Regardless of your personal taste this summer has something to offer dance music fans of all genres, it is just a matter of finding the festival that fits your personal tendencies.